Hitting the slopes this winter ? Be sensible and look after your eyes . We have great advice for buying ski goggles. As the ski season starts in earnest soon, Now is the time to think about getting a new set of goggles to protect your eyes this winter. Why not read our expert advice below then visit the shop to see our offers on great eyewear. We have great deals on the latest sets. We cannot underestimate the importance of looking after your eyes in the harsh winter environment. You don't get a second chance. If your eyes are damaged then they are usually damaged for good. Be sensible. Wear a pair with good UV protection and try and get a pair with good anti fogging technology.This will mean you can see what you are doing whilst travelling at potentially high speed. It's not worth a trip to the hospital because you didn't get the right equipment. Good goggles are designed to shield the face in against the elements in bad weather conditions, which means that they usually don't just cover the eyes, but a large percentage of the normally exposed face aswell.It's possible to get pairs that are more like sunglasses than goggles, but they tend not to offer as much protection on the slope,especially when you hit heavy wind and snow.The smaller pairs also tend obstruct the peripheral vision more as the frames tend to get in the way. Regardless of what size they are, they are designed promarily to fit and cover the eyes.This helps stop wind,ice or snow from stinging the eyes and blurring the eyesight.Any lens covering the eyes should be large to give the best possible peripheral vision and make sure nothing you are wearing interferes with your sight as you go down the ski slope. Goggle lens frames are normally made of much softer materials than normal sunglass frames.This helps to prevent them from hurting the wearer if they have a fall and roll down the slope. Traditional plastics tend to be hard and therefore might damage the user in a fall.Nylon and rubber are the most popular choices because they are comfortable over long periods and resist the tendancy to crack or snap in the extreme cold. 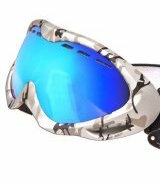 Ski goggles usually are attatched to the head by using a large,adjustable,elasticated strap around the back of the skull. This makes sure that your eye protection doesn't get loose no matter where your ski adventures take you. Lenses are usually a yellow or orange color. This is by design and enables a high contrast.This means you you can see the shape of the slope in the snow,which is sometimes hard in a bright,crisp white environment.The orange hue takes out blue frequencies of the colour spectrum enabling you to see more clearly on the highly reflective ski slope. Rose/red is another colour that helps a great deal with contrast problems on the slope and is also very popular, but the orange tint seems to win overall. To polarize or not ? Light reflected off the surfaces of a flat ski slope tends to be horizontally polarized. This basically means that, instead of the light being sent in all directions as usually happens, the reflected light tends to travel in a more horizontal direction. This can create an bright and potentially dangerous level of light that we see as glare. Polarizing lenses cut glare reflected off of the slopes by using a special filter that blocks this type of reflection.Thus reducing glare. Some people think you shouldn't wear polarized goggles when skiing or boarding, because you may be unable to see ice on the slopes that you need to avoid.However goggles with polarizing lenses can reduce light reflections off the snow and ice that most skiers find annoying. As a skier, you'll need to consider the implications of using lenses that are polarized and what you are most comfortable wearing.There is no simple right or wrong, and it's very much a personal choice. They come in the more traditional colours such as gray and brown, as well as in the orangy or redder tones that combine better contrast with glare and reflection reduction. Look for anti-fogging features such as double lenses, anti-fog coating and wide side vents.This will stop you becoming visually impaired when travelling at potentially high speed down the slope.It's always a good idea to be able to see where you are going ! If you wear glasses make sure you get goggles that will accomodate them. Make sure you take them shopping when you buy the goggles.You can even get sets that have inserts to accomodate prescription lenses. Get a set with scratch resistant coating.Also get a case for your set when not in use.They will last much much longer.